Tonight, night one of the Super Bowl of Racing is set to get underway. 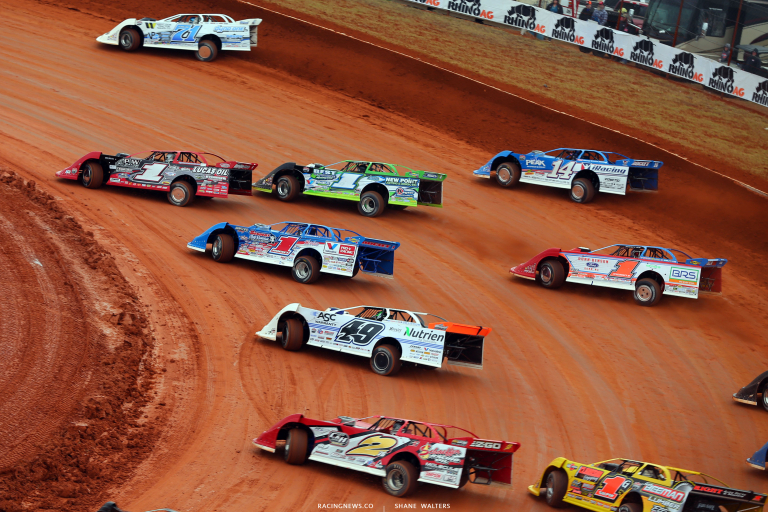 It’s the season opener for the Lucas Oil Late Model Dirt Series. 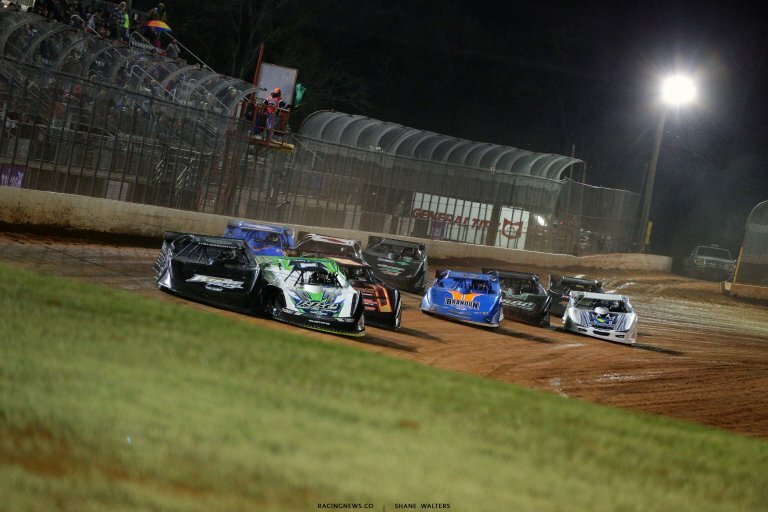 Golden Isles Speedway hosts the event at the 4/10-mile dirt track in Brunswick, Georgia. 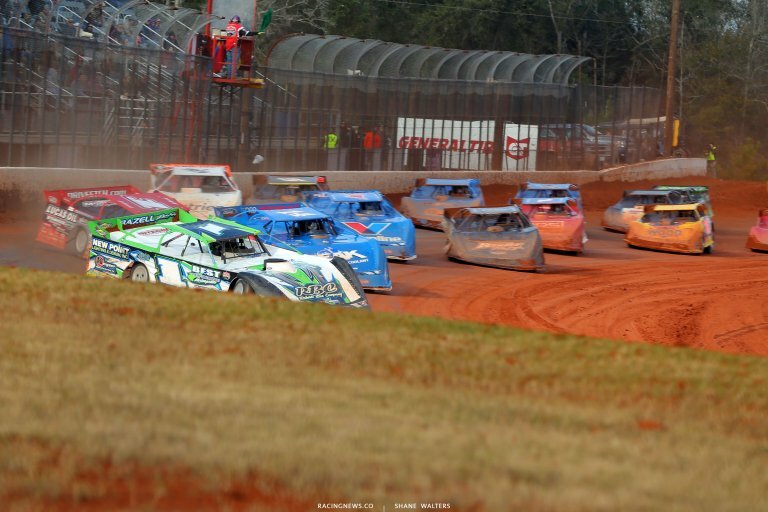 View full 2019 Golden Isles Speedway results below. Hudson O’Neal and Josh Richards were quickest in practice last night. They were quick here last year as well as Richards swept the weekend in 2018. Tonight’s feature race winner will put it back in the box with the $12,000 check. No times for group A in hot laps. Tim McCreadie was fastest in hot lap group B with a 15.161. Josh Richards was quickest in group C with a 15.025. Tyler Erb was quickest in the final group at 15.062 seconds. Jason Jameson tagged the wall on his opening lap of qualifying. That put a halt on Pearson Jr’s lap. As they got going again, Pearson set a new track record. It was short lived. In the group that followed, Hudson O’Neal took away the top spot and the track record at 14.864. The middle of the track is already slicked over. The groove is right against the wall in qualifying. Light rain has begun to fall as the cars roll to the track. Hudson O’Neal and Ryan King trail the pace truck ahead of the first race in the new season. 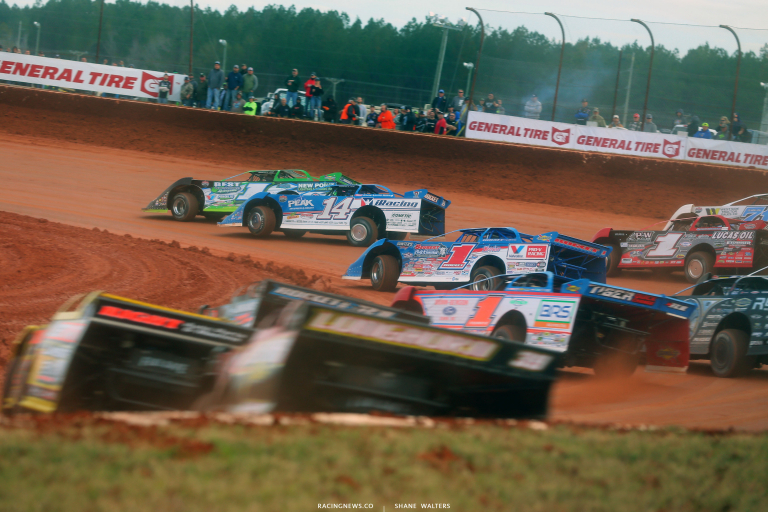 Green, O’Neal and Sheppard run even into turn one. Sheppard noses ahead through the middle. O’Neal powers even on the cushion and leads off turn two. Several cars tag the wall in turn one. We remain green. The field stacked up to avoid incident. Billy Moyer Jr did not. He split them four wide off turn two and picked up several spots. Lap 5, O’Neal and Sheppard run nose to tail at the front. Sheppard is looking through the middle but can’t complete the pass. O’Neal is inches from the wall. Sheppard is still trying. Final lap, O’Neal begins to smoke. He holds the lead and takes the win in the first heat race of the season. Earl Pearson Jr and Jimmy Owens set the front row in heat two. Green, they rub doors at the line. Pearson leads. Caution. Davenport is all over the bumper of Pearson at the flag stand. He cuts to the bottom in turn one. He can’t get it done. Pearson holds the lead off turn two. 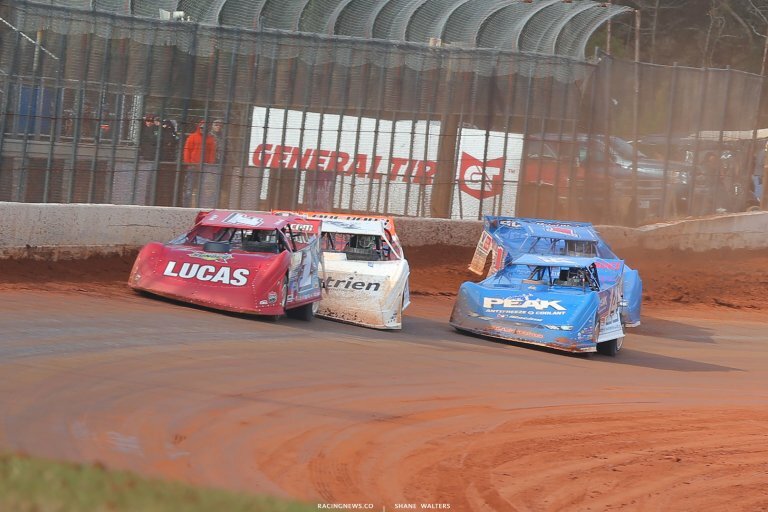 Pearson drives off to win heat two at Golden Isles. Brian Shirley and Josh Richards lead them to the flag stand in heat three. Green, false start. Rain drops continue to fall. Green, Richards holds the lead on the outside. Caution, car stopped in turn two. Green, they fan out in turn one. Richards holds the lead once more. Don O’Neal is closing on Richards. He’s there, they run nose to tail around the top. Lap 7, spin on the front stretch. The caution is out. Green, spin in turn one. Buckingham is involved. Green, Brian Connor is in the wall in turn one. He climbs over the wall and comes to rest on top of it. The caution is back out. Don O’Neal heads to the pits just ahead of the restart! Richards holds off Moran in turn one. Richards drives off to take the win in heat three! 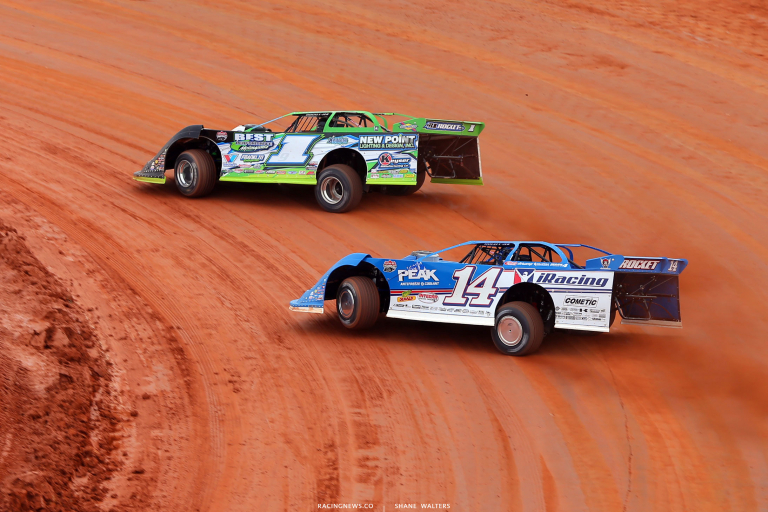 Tyler Erb and Scott Bloomquist line up on row one for the final heat race at Golden Isles Speedway. 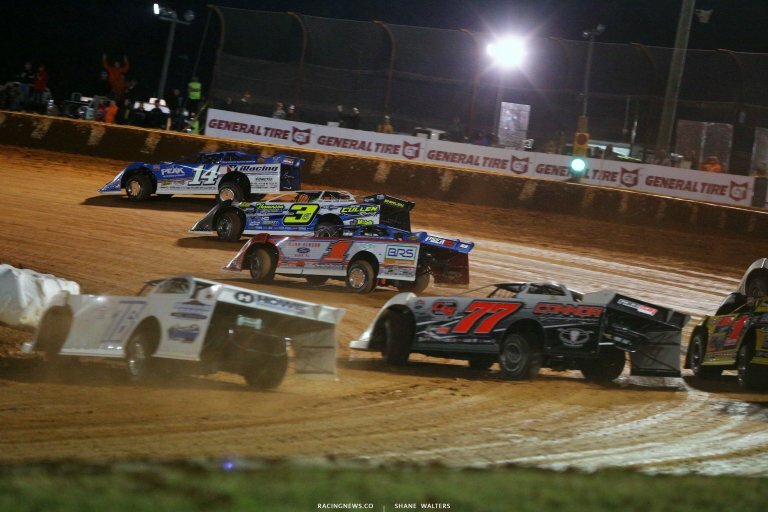 Green, Erb and Bloomquist run even into turn one. They bang doors. 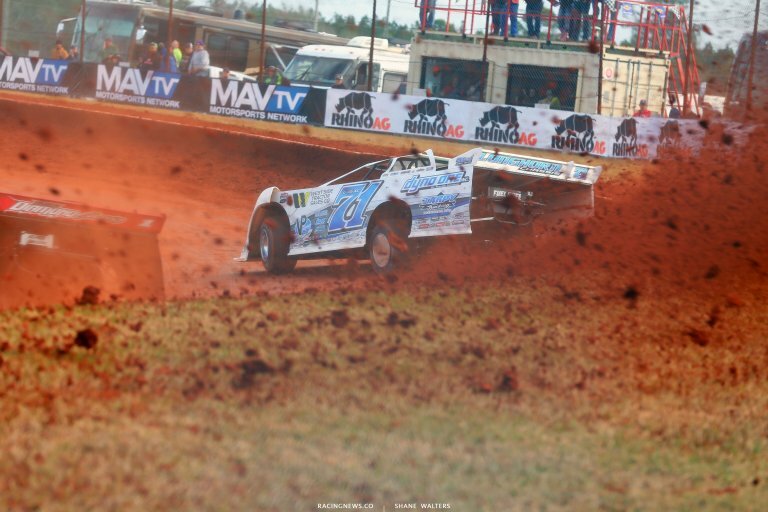 Bloomquist is pushed into the wall! Several cars get collected. The caution is back out as Bloomquist heads to the pit area. Green, Erb leads. 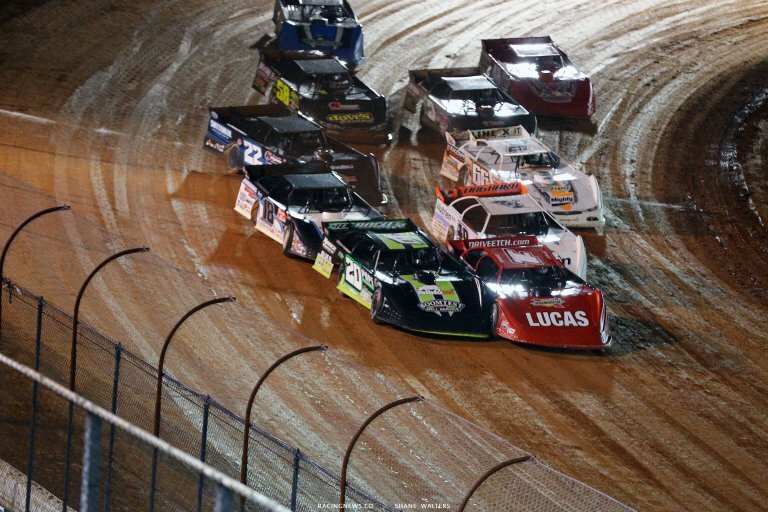 Bloomquist passes three before the exit of turn two. His car is torn up quite a bit though. Tyler Erb drives away to win heat number four with light race overhead. 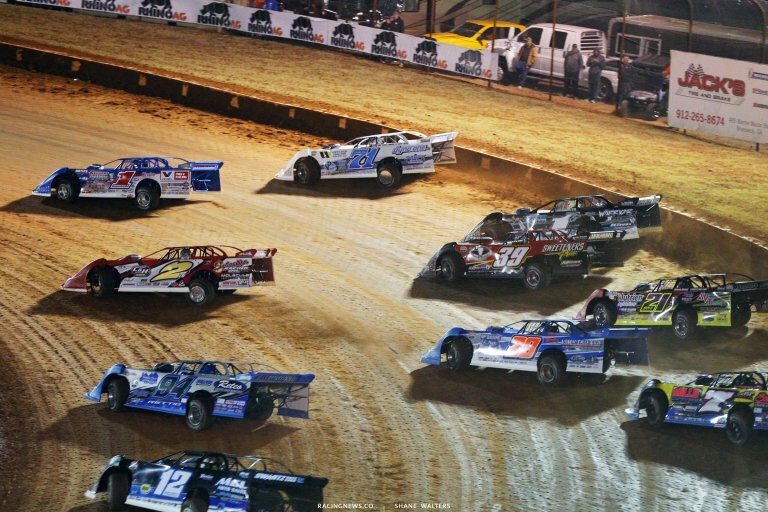 In the middle of B-Main #2, the race has been placed on pause. The rain continues to fall and it has now washed out the race track. Tonight’s racing has been called. Tomorrow will be a double feature. Hudson O’Neal and Josh Richards set the front row for the main event. Chris Ferguson is in the Bloomquist backup car. He blew and engine yesterday and will start at the tail today. Green, Hudson gets the jump. He’s clear by two car lengths into turn one. They run three wide for 2nd. Richards holds that position around the top. Lap 6, Ferguson is slow on the front. The caution is out. He heads to the infield and for the track exit. Green, O’Neal leads. Tyler Erb was looking for 2nd from Richards. The door closed in a hurry as Erb thought about squeezing between the #14 and the wall. Lap 12, Stormy Scott has a flat. The caution is out. Green, Hudson O’Neal jumps the cushion in turn one! Tyler Erb and Josh Richards both drive by on the inside. Lap 17, Bronson tags the wall off turn four. Stormy Scott is around, caution. Green, Pearson to 2nd. Caution is back out. Green, Hudson O’Neal reclaims 2nd. 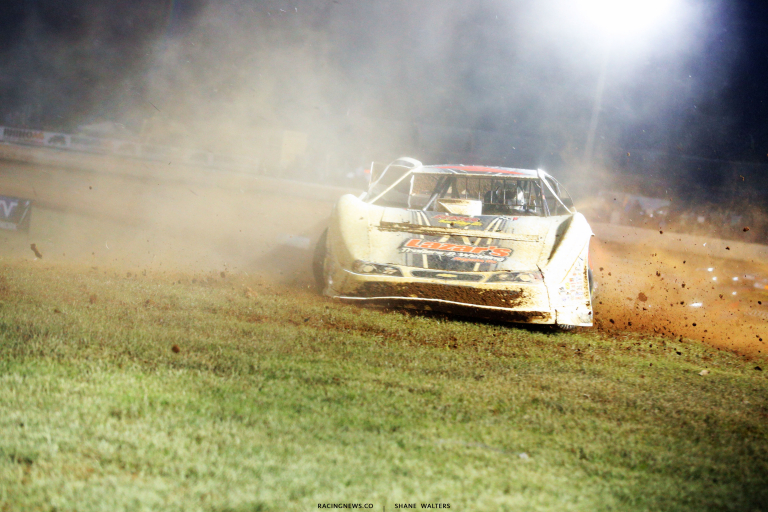 Trouble behind them, Jimmy Owens and Tim McCreadie tangle in turn three. Green, O’Neal leads. Big crash down the back stretch! Brian Shirley is pointing toward the sky. He rolled it several times at a fast point on the race track while in the 8th position. Shirley came to a rest on his roof. They rolled it back over and Shirley climbed from the car. The red is out. 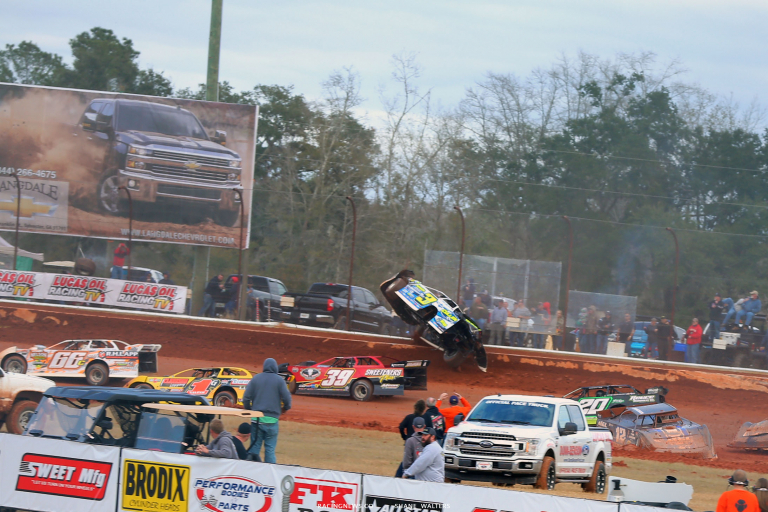 Green, Hudson O’Neal slams the cushion in turn one. Erb heads for the bottom. Lap 27, Hudson O’Neal jumps the cushion and tags the wall. He heads to the hauler with suspension damage. The caution is out. Green, Tyler Erb leads. Davenport is coming to the front. He’s got a run on Pearson. Davenport gets into the back of Pearson into turn one. He had a run but Richards was to his inside. It was either lightly bump Pearson lightly or lift off the gas. Davenport didn’t lift as he cuts to the bottom, threads the needle between them and slides Pearson in turn one to claim 2nd. It was slick! Lap 42, Tyler Erb leads by 15 car lengths. Pearson has run Davemport back down. He slides him in turn one and takes 2nd back away. 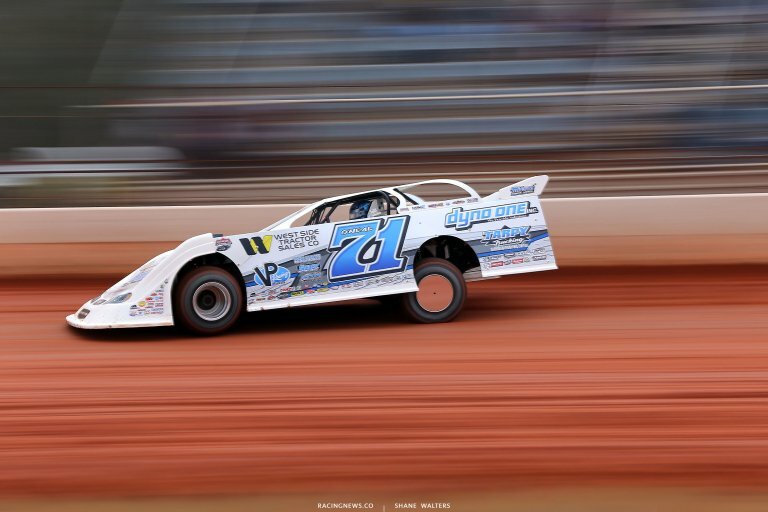 Tyler Erb takes the win at Golden Isles Speedway! View full Super Bowl of Racing results from Brunswick, Georgia below.